Nice post and I like your definitions! I do wonder if you think that the people who develop innovations need some kind of expertise or not, and if the process of innovation for well-being is always an “organized activity”? Let’s have a look at Ezio Manzini”s latest book: “Design, When Everybody Designs: An Introduction to Design for Social Innovation” (https://mitpress.mit.edu/books/design-when-everybody-designs). He discusses “diffuse design” in which people organize initiatives to change their own situations for the better. And “expert design” in which people with design skills/education can support such initiatives. Yes, I think that something like “design capability” is needed in people who are involved in (formal or informal; expert or diffuse) design activities (Nichols and Dong, 2012, Re-conceptualizing Design Through the Capability Approach). In addition, I’d like to mention Nelson and Stolterman’s “The design way”, in which they argue that design has been around since the dawn of man and that is simply the human capability to improve/change their environment and to develop tools to do that. 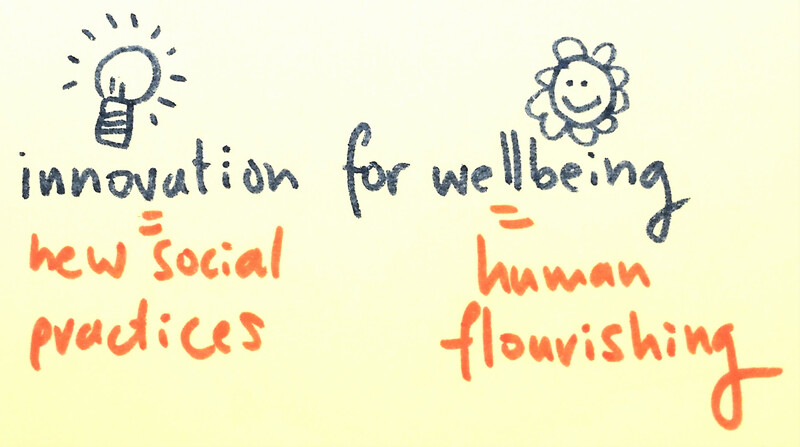 It seems the way you define wellbeing is the very positive soll situation, because you use the word flourishing. That’s not a common definition of wellbeing. Why do you choose to come with a new definition, it might make it harder to use already available literature and data that can help you reaching your goal? So what do you expect/ hope this new definition will bring us extra? Is that worth it, considering what your goal is? Innovations can also lead to widespread effects of despair or depression. We don’t know what the longer term will bring us with a certain innovation. Is this website also meant to share bad practices? Or do you want to focus on best practices?